LG Tone Studio wearable speaker will arrive in May | What Hi-Fi? The strange wear-around-your-neck speaker will go on sale in the UK in May, just in time for summer. LG's mad-as-a-March-hare wearable speaker is actually real, and will actually go on sale in May. When we first saw it at CES, we thought the Tone Studio was a hallucination brought on by too much Las Vegas air conditioning. But it seems we were wrong. Other territories are getting the speaker before us Brits. It lands in the Middle East this week, North American markets at the end of the month, then Asia and Latin America in April before coming to Europe in May. 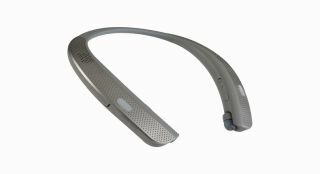 LG claims the Tone Studio is the world's first wearable audio device to deliver 3D surround sound on the go. Presumably that's because its speakers go all the way around your neck, rather than due to any clever processing LG has managed to pull off. It can be used with a range of audio sources, including phones, tablets, MP3 players and games consoles. The idea is to provide audio without isolating you from the environment, so you can ride a bike, cook or do all manner of other activities while still hearing approaching cars and someone ringing the doorbell. Tone Studio boasts four external speakers: two sit right under your ears, while two vibrate against your collarbone. There's also a built-in DAC, and two wearers can derive audio from the same source - so you can share the tunes without turning the volume up too loud and damaging your hearing (or collarbone). Will it catch on? We have to doubt it. Still, it's certainly a different device and could prove useful in certain situations. LG will announce the price nearer to launch.